Erana Clark is one of Australia's most sought after session singers. Erana has sung the world over for the likes of INXS, Midnight Oil, Renee Geyer, Tom Jones, Wendy Matthews, Kate Ceberano, Christian City Church Oxford Falls and of course her fellow Australian Idol friend, Marcia Hines. Erana's official title at Australian Idol for the first and second seasons is vocal coach but her role goes much deeper. Erana often finds herself helping the Australian Idol contestants to handle the pressure that they face as the showdown becomes too much to handle on their own. Erana draws on personal experience, which she gained as a young woman in New Zealand. Between the ages of 12 - 16 she hosted her own TV show and achieved the coveted fame of a top ten hit on the singles chart. Erana often takes the opportunity to pray and encourage the contestants with her newfound faith in a mighty God who delivered her from drugs and alcohol. 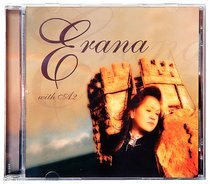 Erana's songs have been born from these victories with God, through a message that is deep and real. Many performers and co-workers have found this faith to be real, along with thousands who have come to her concerts over recent months.